Roosting birds outnumber rowdy fans lately in Nationwide Arena, left empty most nights during the bitter NHL lockout. It’s an attendance figure that is not lost on state, Columbus and Franklin County officials, who estimate they’ll lose $3 million to $4 million in tax revenue if the NHL season is canceled. That sum represents lost income taxes from players and other workers associated with hockey, and sales taxes from concessions, restaurants and other commercial activity near the arena, which the city and county bought last year. Really? Do we have to go over this again? Okay, fine: Yes, people are spending less money at the arena because there’s no hockey. And yes, that means less sales tax money from spending around the arena going into public coffers. It doesn’t mean less sales tax money overall, though. 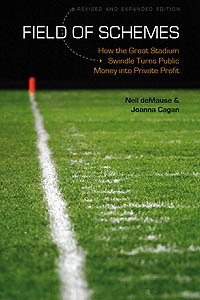 As I’ve noted before, studies of sales tax revenues in cities during sports work stoppages found “no statistically significant effect on taxable sales is found from the sudden absence of professional sports due to strikes and lockouts.” That’s because when people aren’t spending their money on hockey, they’re usually spending it on something else — and they’re almost certainly spending it within the same state and county, and given that Columbus has become the largest city in Ohio by annexing every suburb in sight, likely within the city limits, too. So if tax revenue is going down in downtown Columbus, it’s likely going up everywhere else. And while the county is now the owner of the arena (since it bought out the arena from its private owners as a bailout of the Blue Jackets last year), it only gets to collect parking and concessions sales for non-hockey events — so if anything, the county should be in a position to bring in slightly more money since there are fewer hockey dates cluttering up the schedule. Emphasis on “slightly,” though, since it’s tough to book vacant dates when the NHL has so far only been cancelling games a few weeks in advance. Still, even in its capacity as arena manager, the lockout shouldn’t be hurting local government revenues. A more honest headline, then, would have been “NHL lockout has both tax costs and benefits.” And maybe reporter Lucas Sullivan could have called one of the five economists who’ve studied the economic effects of strikes and lockouts for comment, instead of the only quotes coming from county and league officials. Hey, it’s nice to want things. This entry was posted in Columbus Blue Jackets, economic impact studies by Neil deMause. Bookmark the permalink. Columbus aside, couldn’t there be public $ impact by the lockout with TIFs being paid back to the city/county with “taxes” on each ticket. If so, I’ve wondered why more local governments don’t speak out on the lockout. Nationwide Insurance and the Columbus Dispatch were the main parties in building the Nationwide Arena. They’ve been bailed out at this point, but the wikipedia entry shows that there’s still some money on the line for the current ownership. In addition, the Ohio Department of Development agreed to a 10-year, $10 million loan to the FCCFA to assist with the facilities purchase. If the Blue Jackets meet annual roster payroll requirement, $500,000 of this loan per year will be forgiven. Sorry, the point being that listening to the Columbus Dispatch bellow about the local government losing money is kind of funny… because it wasn’t that long ago they were the ones taking the loss and they’re probably not eager to write follow-up stories about how the arena they sold to the County is plunging deeper into the red. Ha, good point about the Dispatch. As for TIFs being paid back by ticket taxes, in most cities (Columbus included) the TIF is just on increased property taxes, not sales or admissions taxes. But yes, some cities may end up having to backstop lost revenues from ticket taxes, if their leases don’t spell out what happens during a work stoppage. Couldn’t tell you off the top of my head which NHL cities that applies to — will check with Judith Grant Long and see if she knows. I understood that the roosting birds outnumbered paying fans at Nationwide even when the Jackets are playing… hence the endless subsidies, and underlying problem. Yogi Berra once said that “if people don’t wanna come out to the ballpark you can’t stop ’em” (more or less…). True, but apparently you can make them pay whether they go or not. We’re seeing similar stories out of Boston and D.C. Pathetic excuses for reporting. Even worse excuses for getting clicks.